Another Terrific Review for EVERYBODY NEEDS A BUDDY! activism, immigration, community involvement . . . 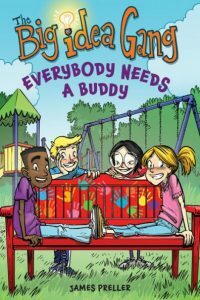 I am so glad to pass along this incredible review for my “buddy bench” book, Everybody Needs a Buddy. Thank you so much, Kate Nafz, of School Library Journal. Many nice things here, including a comparison to Wonder and a shout out to the illustrations of Stephen Gilpin. Pub date is late January. Would I like to see our young people socially active and engaged in making this a kinder planet? I’m counting on it! This full review will be published in the December issue of SLJ.